Look @ how much the folks at L'BRI Pure n' Natural love me! This is what they hooked me up with to review! How generous! 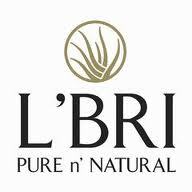 L'BRI offers quality, affordable aloe vera based skin care products.The story of L'BRI Pure n' Natural is a very inspirational one. A husband and wife team came up with the idea for these products after the husband was badly burned in a chemical accident. They realized the power of aloe vera after seeing how nicely it helped to heal the burns, and their idea for a skin care company was born! You can read their amazing story here. I love any type of aloe vera products,and I am trying to do better with the things I put on my skin, so I was very excited to give these a try! The three step skin care plan includes cleanser, freshener, and moisturizer. I received the Deep Pore Cleanser. It is like a gel cleanser, and removes all traces of makeup, pore clogging oils, and environmental pollutants. It calms & soothes blemished skin, and removes eye makeup easily. I absolutely loved this stuff, it is so gentle, but it works perfectly! It is the only facial cleanser I have used that did not make my skin burn afterwards! The next step is the Freshening step. I recieved the gentle freshener. It is alcohol free, and contains Aloe, Arnica, Ginseng and Chamomile. It refines pores and improves circulation. It is also safe to use around eyes. I really liked this product! The final step is moisture. The lotion is so creamy and rich, but not at all oily. I hate using moisturizers because I don't like my skin to be greasy, but this time it wasn't! This is a really good moisturizer, and it just made my skin feel "rested" after using it. Those are the three steps of the L'BRI skin care plan, but that is definitely not all the products they offer! They have so many products, there is truly something for everyone! They sent a wonderful face and body scrub that I adore, it is gentle yet effective, and really did a great job. I also really liked the Klear Away acne treatment gel. It contains Aloe, Willow Bark, and Papaya extract. L'BRI products go well beyond just skincare, too. They also have a shampoo, conditioner, and body wash. I didn't get to try it, but it looks great, and sounds like it would be really hydrating. They also have an entire line of cosmetics, as well as a pain relief cream and a dietary supplement. I'm telling you, something for everyone! I was very impressed with these products from L'BRI, and I have even started using moisturizer, and taking off my makeup at the end of the day. There may be hope for me yet! Thanks L'BRI for providing me with these wonderful products to try! Get Your Own! To get your own aloe vera based skincare and cosmetic products, just click here! You can also order a sample pack, which includes samples of the Facial Peel,Facial Masque, Smooth n' Firm Eye Repair gel, Body Scrub, Cleanser, Freshener and Lotion as well as tons of helpful info. You can do that by clicking here. Disclosure: I was provided with products to aid in my review. No other compensation was received. All opinions are mine.